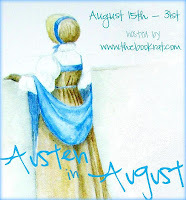 The Book Rat: Austen in August Welcome & Schedule!! Welcome Janeites (and newbies! ); if you've joined me before for Jane in June, yes, this is the same thing - just later! (I had a crazy June, sorry!) If you're new to the Jane Game, allow me to explain: Austen in August is basically a Jane Austen lovefest. Here, you'll find author interviews (with a twist this year), giveaways, book reviews, guest posts, games - in short, everything I - and fellow Janeites - could come up with to spread the love of Jane and shine a light on not only her works, but continuations of them from dedicated fans and authors. and you'll find it at the bottom of every page! A lot of the awesome things you're going to stumble across were contributed by awesome bloggers and authors who - like me - find themselves a tad obsessed with Jane (or are new to the fandom but wanted to dive in head first). You may find yourself regretting that you didn't get to contribute some piece of your Jane-loving ways, and if you find yourself in that position, fear not! There is a participation linky set up for you to share your own posts, reviews, lists, vlogs and giveaways at any time! And you're also encouraged to participate in the discussions or the Persuasion read along!! The rest I'm sure is pretty self-explanatory - browse, read, chime in, enter to win, channel your inner Lizzie (or your inner-Lydia...this is a judgement free zone who am I kidding? ), and above all, HAVE FUN!! Review: Sanditon by Jane Austen and "Another Lady"
Dear Janeite #1, featuring guest Janeite, Diana Peterfreund! Giveaway: Custom Art from the Antique Fashionista! Guest post: 5 Reasons I'd Rather Marry Wentworth... + giveaway of Persuasion (2007)!